At Spa-Tech Spa Repair, we understand our Orange County customers want to use their spa time to relax and unwind. That's why we recommend the installation of spa cover lifts, which allow you to easily move and store your spa cover so that it's properly pulled back when you want to enjoy your hot tub or spa and is fully covered and protected when it isn't in use. Available through our sister company, Spa Cover Pros, we've sold our high-quality spa lifts to thousands of satisfied residential spa owners throughout Orange County. Custom-fitted and made with non-corrosive, powder-coated materials that resist rust and chlorine, our spa cover lifts are durable and affordable. We can often install a new lift for the same cost of repairing your old one, and we take great pride in our workmanship. Manufactured by EZ Lift and Cover Mate, our lifts are lightweight and low-maintenance. They are ergonomically designed so that you no longer have to struggle with a heavy, unwieldy spa cover, thus allowing you to better enjoy your spa time. You can choose a spa cover lifter with an under style bracket system (our specialty), hydraulic assisted system, aluminum tubing bracket system, and more. To install a new spa cover lift, call us today. 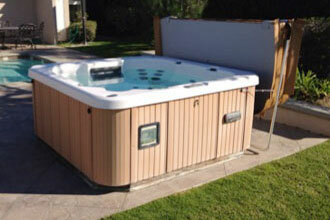 Our experts can install your new spa lift onto an existing spa cover. We also handcraft our own high-quality custom-fitted spa covers for above ground and in-ground hot tubs and spas in Orange County. Jim is great. I had him replace our spa cover and the new cover is excellent. Jim is also trustworthy, honest and was able to take care of our needs faster than I thought possible. I'll never call anyone else for the spa.